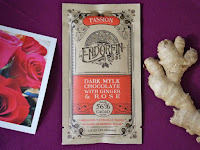 Today's Dark Mylk Chocolate Ginger and Rose bar from Endorfin Foods (Oakland, CA), was part of a 9-bar (community supported subscription) box that I picked up recently that contained both single origin and flavored bars. 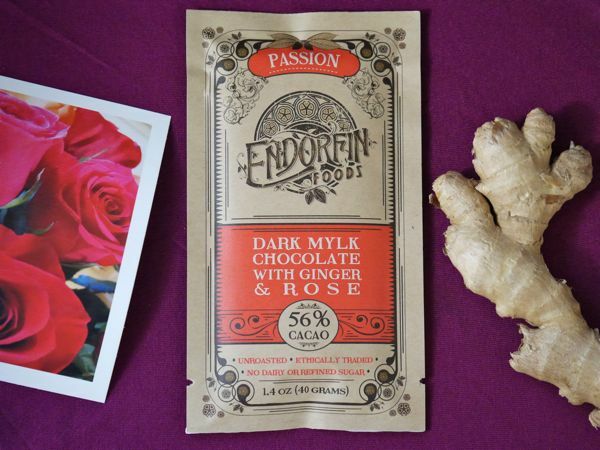 Endorfin Foods is the creation of Brian Wallace ("founder/maker/alchemist"), who offers a beautifully designed and packaged line of dairy-free chocolate "mylk" bars* made with unroasted cacao. Brian's attention to detail shows in his offerings. Why not just call these "raw" (vs. unroasted) cacao bars? Technically you can have unroasted cacao chocolate—that preserves certain antioxidants and flavors—where temperatures may have exceeded a certain degree range during the making process, e.g., during conching and/or tempering. Ginger is a wonderfully warming flavor in winter, and can stand up to chocolate in a delightfully robust and complementary way. I wondered: Would the ginger overwhelm the rose? Thankfully both flavors were artfully layered in this bar. 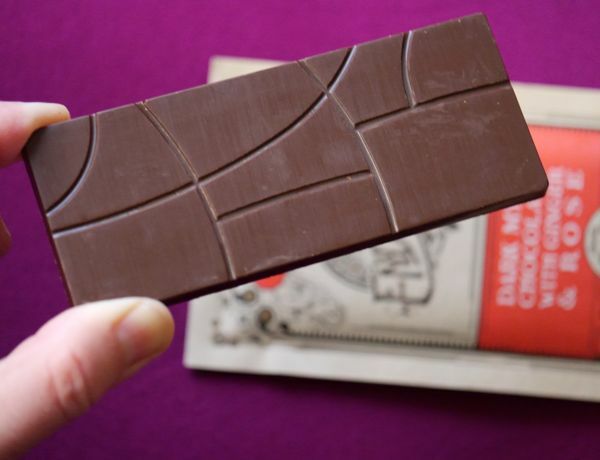 This 56% cacao "Passion" bar had a spicy ginger aroma and was smooth, with a fairly creamy melt. An initial pleasing ginger taste gave way to an enjoyable authentic rose floral flavor. And the bar finished with a nice ginger kick. Ingredients list: organic cacao, organic coconut sugar, organic coconut, organic cocoa butter, and organic essential oils of ginger and rose. "Mylk is the New Dark" the packaging read. Endorfin's dark "mylk" formulation is a non-milk (or "filk") chocolate, that has the creaminess of a milk chocolate, but without the dairy. I've used the term fake milk or "filk" to describe various nut, coconut, soy and other milk substitutes. This term is not meant to be derogatory; it was the shortest contraction I could think of when faced with a dazzling, expanding array of "milk" alternatives several years ago. There have been, e.g., some terrific, smooth and creamy coconut milk bars in the last several years that prove you can make great "milk" chocolate without animal milk. 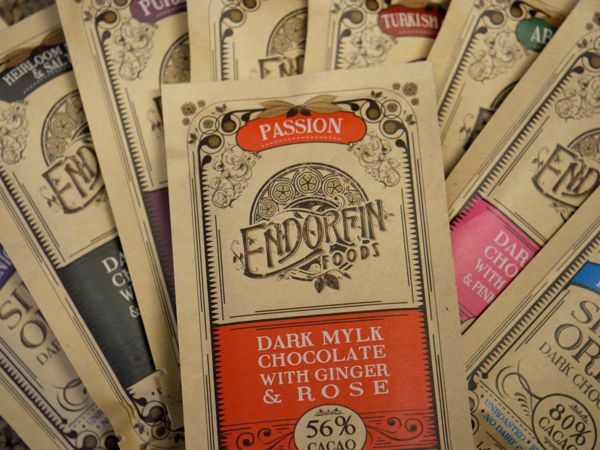 Endorfin bars are crafted with "No Dairy, Soy, Gluten, GMO, or Refined Sugar," and with organic, ethically traded cacao.